Brussels – The European Union has agreed on a set of directives to negotiate a transitional period after Britain’s exit from the bloc as ministers from the remaining 27 countries called on Britain yet again to provide more clarity about the future. European affairs ministers of the 27 countries endorsed a mandate for EU negotiators to seek agreement from Britain for a transition period that would last from Britain’s exit from the bloc in March 2019 until the end of 2020. During this interim time, which negotiators will use to strike a deal over the future trade relationship between Britain and the bloc, EU rules would fully apply in Britain, even as the country would have no say in EU decision-making processes. The EU is pushing to ensure free movement of EU citizens in Britain until the end of the transition period instead of the date of Britain’s withdrawal from the bloc, which had been agreed to by EU and British negotiators in December. 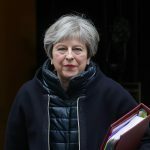 Before the meeting where the new negotiating directives were adopted, several EU 27 ministers urged Britain to clarify what type of future relationship it wants with the bloc. “The sooner the Brits are clear about the future, the better for everybody,” said Italian State Secretary Sandro Gozi. He said Italy was “not necessarily flexible but open” to the option of lengthening the transition period if it becomes clear that more time is needed to conclude a trade agreement.